In a historic first, India’s prominent religious leaders from diverse faiths, assembled at this year’s Ganga Sagar Mela, today, to pledge their support for Mission Nirmal Bangla to inspire masses for the use of toilets and follow correct sanitation practices. Ganga Sagar Mela is the largest religious congregation celebrated every year in India at Sagar island of South 24 Parganas in West Bengal on the occasion of Makar Sankranti. A dip in the confluence of Muriganga and the Bay of Bengal is considered to be of great religious significance particularly on these few days making this place a home to a great event, drawing visitors and recluses from all over the country. This year Ganga Sagar Mela 2016 has been envisioned as a green and clean mela making a first of its kind endeavour in India. 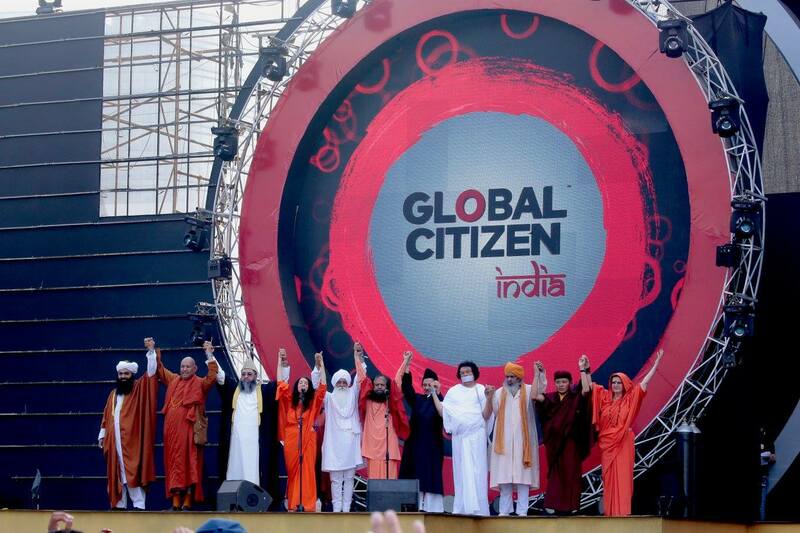 Representing five faiths, the faith leaders were brought together by the Global Interfaith WASH Alliance (GIWA), with technical support from UNICEF, and under the inspiration of HH Pujya Swami Chidanand Saraswati, President, Parmarth Niketan, Rishikesh, and Chairman of GIWA, India. Apart from the Sarva Dharma Swachhta Sankalp, in order to preserve the sagar environment and prevent public health hazard, a total number of more than 13,000 yellow colour coded sanitary toilets have been installed for the usage of the pilgrims at different points of Ganga Sagar Mela and transit locations with the facility of water, and hundreds of cleaning Volunteers. To sensitize the lakhs of pilgrims visiting the Mela about the need for cleanliness, extensive communication strategy involving both outdoor and personalized one to one sensitization through Clean Volunteers were adopted. Community Volunteers were formed into groups for round the clock Najardari (Vigil) of the entire cleanliness drive. An extensive Safai Abhiyan (Cleanliness Drive) was organized on 1st Jan at all transit locations and mela area, followed by a repeat Safai Abhiyaan on 12th Jan, led by District magistrate and the Mahanth of Ganga Sagar Ashram. To make the mela ground a plastic free zone, Anti Plastic Campaign are being organized sensitizing all shop owners of the local areas (not to use plastic bags and cups of less than 40 micron) and making alternative arrangements. Five exclusive units have been set up for the Solid Waste Management during this year Ganga Sagar Mela. Massive human chains were formed at all four transit points, all four buffer locations and mela ground involving all volunteers and NGOs prior to the Swachhta Sankalp which was followed with a massive cleanliness drive in all these locations. More than 2000 clean volunteers including NCC Volunteers have been deployed for awareness, monitoring and surveillance of these cleanliness initiatives. As a precursor towards clean mela, all houses in Sagar Block has been saturated with toilet facilities and the Block has been declared as “Open Defecation Free” Block of the district on 7th January. India has the largest number of people defecating in the open and not using toilets-more than 595 million. Poor sanitation can cause diarrhoea, which accounts for 9 per cent of the 1.2 million deaths of children below five years, every year. ‘We have been mobilizing partners and stakeholders, including religious leaders to make this year’s Ganga Sagar Mela a Clean and Green Mela. I see this as a platform with huge potential to create awareness, and motivate changes in attitudes around elimination of open defecation. Since the pilgrims come from all around the country, I believe beyond the Mela the pilgrims will take the message of Cleanliness to their respective areas which will have a rippling effect,” shares Dr. P. B. Salim, District Magistrate of South 24 Parganas who has lead this entire innovative initiative. A water blessing ceremony also took place on the occasion where the revered faith leaders and dignitaries poured holy water from the Ganga Sagar over a globe, symbolizing a prayer for action so that people all around the world have access to clean water, sanitation and hygiene (WASH). Officers of the District Administration, several NGOS, safai karamacharyis and manual scavengers were honored as the true Sanitation Ambassadors. They were given a sacred green sapling for their dedication and commitment towards making the Ganga Sagar Mela a Clean, Green and Serene one.